Most Scholarships and Fellowship programmes have a step-by-step procedure involving application, scholarship interview, scholarship essay submissions and scholarship recommendations. In the series of all such procedures students find Scholarship interviews to be a tad bit difficult than others. It certainly is not that tedious once we get to know the comprehensive details of Scholarship Interview preparation. Buddy4Study having assisted many students to achieve their study abroad ambitions has listed the peculiar points to remember while preparing for your scholarship interview. Review your submitted application details thoroughly. Review the scholarship program information & the organization who is providing it. Learn about current affairs by reading national newspapers. Try not to show signs of nervousness. While getting questions fired at you that you have no answer to, ask the judges to clarify the question. Sit straight when you face the judges, make eye contact. Don’t do any unnecessary movement. During the scholarship interview, take your time responding to questions; don’t rush your answers. If you want to “warm up” before your interview, think of the significant accomplishments you had and what you are PASSIONATE about. Sometimes the interviewers have no idea about the expenses students have for travel, accommodation, meals, study materials, learning equipments and for other things. Therefore, it is good to prepare a monthly expense report. A simple break of your expenses, activity after activity, day after day will be helpful for you. Personal Questions: Interviewer wants to learn, Who you are. 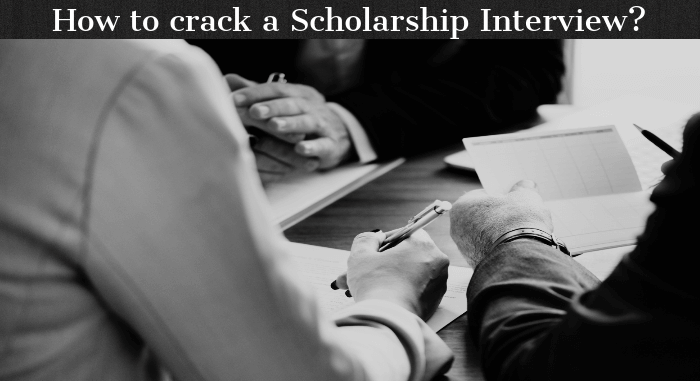 This question is often used as an ice-breaker and should give the scholarship committee a better idea of who you are as an individual. They want to know what sets you apart from the other scholarship candidates, whether that’s a talent or activity you like most. Use an example that really illustrates a time where you were placed in an uncomfortable situation; for example, confronting someone who may have been bullying you or dealing with a difficult teacher. It’s basically the scholarship committee’s way of finding out if you have a game plan. Try to envision during the scholarship interview where you want to be in five years, and then figure out how to get there. Your plan should include how long you will remain in college (bachelor’s, master’s, or higher? ), internships or other outside activities that will help improve your chances of accomplishing your goals, as well as a financial strategy to cover all your expenses. It’s one thing to say you ‘need’ money for college, but it’s quite another to actually show a provider where the proceeds will be put to use. Plan ahead by creating a budget that spells out all your estimated expenses for obtaining your degree, and don’t forget to include any anticipated income you may receive from your family or other resources. Assure the committee that you are applying to other scholarships, as well. It will impress the scholarship interview committee if they see you are taking an active role in keeping your student debt to a minimum. Don’t forget to bring along extra copies of your budget, too, just in case the committee wants a closer look. Don’t brag about your GPA or how many clubs you belong to at school. Some International scholarships do not even consider the GPAs. Instead, be honest with the scholarship interview committee and acknowledge that there are other worthy candidates that probably deserve the award as much as you do, but remind them that your work ethic and past accomplishments are a good indicator of your future success. 6. What do you want to accomplish in your life? 7. What do you do for fun? What do you do in your spare time? 8. Who is a role model for you? Name a person and the quality of him. Anyone form Gandhi to Narendra modi. Can also be a family member. Father, Mother. Be ready with the reasons too. 9. How would you define life? They may give you an opportunity to say whatever you want, so be ready. 10. Why will this scholarship help you in your career goals? 11. What would you do if you didn’t receive the fellowship? 12. What is your greatest strength and weakness? Use a particular instance to illustrate your strength.When talking about a weakness, be honest. but it is very impressive to see that you are also taking steps to minimize and perhaps overcome that weakness.You want the scholarship interview panel to believe that your weakness will not keep you from being successful as a college student. 1. What graduate schools/programs have you been accepted into? 2. What influenced your choice of this major? 3. Why did you choose this college? It is better to explain why the college’s features are important to you. Walk the interviewers through the thought process you went through when selecting the college. This will help them understand what is important to you and it will also show them how seriously you considered your choice of a college and the education you hope to attain there. 4. What is your favorite subject in school and why? If you say that your favorite subject is English, you can speak about a writing competition that you won. 5. Why do you want to enter this career? 6. Share your inspiration for wanting this career. Name few well known alumni or personality who achieved big success in your interest field. For eg. In Mathematics: Name few scientists or mathematician. The last impression you leave is often the strongest. If you think you’ve already left a strong impression during the scholarship interview, then you don’t have to say anything. But if you think you need to reemphasize an important point, this is the time to make a final statement. Always conclude the meeting on a positive note. Be sure to shake the hands of everyone who participated in the interview, looking them in the eye and acknowledging them. Thank them for their time and consideration, and be sure to let them know that you would be happy to address any follow-up questions, should they arise. Practicing for these questions will not only make your answers better, but it will help to give you confidence before the actual interview. During your scholarship interview, try to relax and have a real conversation with your interviewers. The interview is not designed to be an interrogation.